The mornings are getting a little cold around here. For our special brunch this weekend I decided we needed something nice and warm…and full of cinnamon goodness. One snag…I was too lazy that morning to roll out and stuff cinnamon rolls. This demanded a slacker approach! To the slack cave! Alright, there’s no slack cave. It was worth a try. So, I thought it over and realized who said all those nummy things had to be rolled out? Why not make some sort of pull apart bread or something? 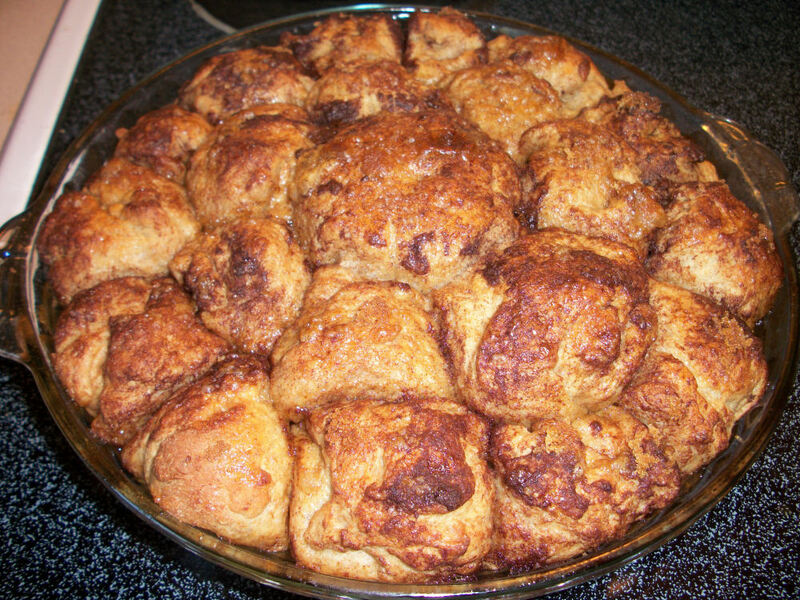 Or better yet, pull apart pie. Ooooo. This bit of tasty works out making it the night before and baking it in the morning too. Tasty, healthy, and full of slacker win. Apparently cinnamon can help you keep your blood sugars even throughout the day too, so I guess that makes it a double win. To the recipe! Combine the bread ingredients to make a dough ball. Proof twice. Spray a pie dish with non stick. Melt the topping ingredients margarine. Combine the splenda and cinnamon in a small bowl. Grab handfuls of dough a bit larger than a tablespoon in size. Shape into a ball, dip in the melted margarine, then coat with the splenda and cinnamon mixture lightly. Place the ball in the pie plate on the edge. Repeat until you have filled the pie plate by lining the outer edge, inner edge, and middle with balls of dipped cinnamon. When assembled drizzle with the pumpkin pie syrup (optional) or a bit of leftover melted margarine and sprinkle the brown sugar on top. This pie can be cut into 8 tasty portions. Each serving contains 208 calories, 2 grams of fat, and 4.3 grams of fibre. Not bad for a breakfast pie! This is so tasty with one of those foamy lattes I’m so fond of having. A great variation is to add other toppings right before you drizzle your syrup or margarine such as nuts, raisins, or dried apples. Just remember to add those nutritionals and that a little can go a long way! Enjoy! I know my husband did…that pie was gone by the end of the day hehehe. It made a great dessert with a bit of ice cream and some sugar free chocolate syrup. This entry was posted in Breakfast, Comfort Foods, Craving Buster, Dessert and tagged Bread, Cinnamon. Bookmark the permalink.